Learning to mouse for trout has been quite the experience. Like fishing at any other time of day, there are so many factors that play into it. Lighting, weather, temperature, time of year, water levels, and location are just a few factors to reckon with. With so many factors dancing about each other, it makes for a slow learning process. It's funny how our outlooks or previously held ideas morph and change with time and experience. Life is dynamic, with very few static elements. If we aren't learning, we are only getting dumber. Needless to say, I still have a lot to learn about mousing for trout. The following is a concept that has slowly formed in my mind, and may not be entirely accurate, but it seems correct so far. It may be helpful, but maybe not. Here it is. I'm going to say it. Mousing for trout is a sham. A farce. Utter foolery without Tom as the instigator. Mousing, as many of us have come to think of it, is not in fact truly "mousing" with many of the traditional mouse patterns we use. Deception is the basis of fly fishing, but that deception can go two ways. Normally we try to fool the fish, but sometimes end up fooling ourselves in the process. This doesn't necessarily lessen our enjoyment of angling, but I think there is some benefit in realizing the distinction, which pertains to mousing for trout. It may even change the flies you choose to fish, or how you fish the ones you're already using. In life we often superimpose our ideas and views onto other people, assuming they see things as we see them. We can't be blamed. All we have to go on is our own perception of reality. Our whole world is viewed through this personalized lens, even our fly fishing. As it pertains to fishing, things that look a certain way to us in our out-of-the-water world, may look completely different to a fish in the water. Full deer hair mouse patterns are notorious for this. They are tied to look just like a mouse that is sitting still, out of the water, eyes, whiskers, ears, and tail to match. An angler looks at one and thinks, "man that looks just like a mouse," failing to ask themselves what a mouse actually looks like in the water, and what parts of a floating fly can actually be seen by a fish. The funny thing is that people catch fish on these flies. Naturally, we assume a fish has taken the fly as a mouse because it looked like a mouse to us out of the water, before we even fished with it. In fly fishing we often fish with "attractor" flies. These are patterns that work because they have elements that resemble the real deals, or just generate curiosity from the fish. Some examples could include: Stimulator, Rainbow Warrior, Royal Wolf, Chubby Chernobyl, Chartreuse Glo Bug, Purple Haze, and Parachute Adams. The list could go on and on. Some of these patterns mimic profile, colors, movement, and water displacement, while others have no similarity at all, and yet they all still catch fish. Imagine a spectrum with one side labeled "natural" and the other "attractor." All flies that are used, or have ever been used, would fit somewhere on this spectrum. If we're being super literal, all flies would be classified as attractors, but what I am referring to moves beyond that assumption and allows flies to assume varying degrees. Where a fly falls on our imaginary spectrum depends on what aspects of a fly we choose to focus on. Factors that would cause a fly to move up or down the scale could include color, movement, profile, or any other specific trait. For example, a Parachute Adams is a common mayfly imitation that most dry fly anglers are familiar with. It is remarkably effective, but I doubt it is because its body color matches many real mayflies. For body color I think the pattern would fall closer to the "attractor" side of things, but for the profile it presents I would say the pattern is closer to the "natural" end. Patterns like this are wonderful go-to's because they can mimic multiple insects. You just have to match the size. I have come to realize that some of the staple flies used while mousing fit better on the "attractor" end of the spectrum. 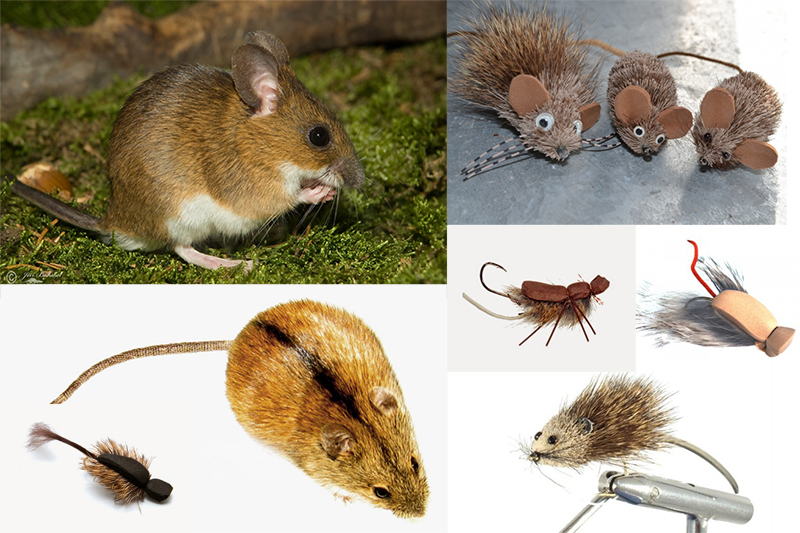 Full deer hair mouse flies, the Morrish Mouse, or any other fairly short mouse pattern are examples of this. The fact is that they work to catch fish, but I truly wonder what the fish thinks it is rising to take. I doubt many baby mice fall into rivers, and even if they did they would be small, skinny, and pink. I may be wrong but most mice are at least two to three inches long (roughly three quarters length) before they leave the nest and start exploring, which is generally when they are about three weeks old. This length is referring to a non-extended, walking, out-of-water mouse. A sitting mouse is even shorter. The distinction is significant because when a mouse falls or crawls into the water it instinctively begins "doggy paddling," which causes the body to extend, adding more length to the profile. Mouse flies that mimmic a "sitting" mouse, not a "swimming" mouse. Most of the original mouse patterns are shorter, stiff haired, and pellet or "A" shaped. As I've already mentioned, these patterns work to catch fish, but I have come to the opinion that most work because they tap into some "knee jerk" reactions deeply embedded in a fishes' primal nature. In the water a mouse is longer than shorter. I tend to think of deer hair patterns that move a decent amount of water as better resembling frogs than mice. Their silhouette certainly better matches a frog kicking around. With the smaller "mouse" patterns I sometimes wonder if the fish aren't thinking they are rising to a giant caddis or other insect struggling in the water or skimming on the surface. The movement alone may induce a bite because the motion is similar to how an injured baitfish would act on the surface, even if the profile is different. I'm not sure the fish even really cares what they represent. Just like most human beings would run to an injured and abandoned crying baby, a fish will at least investigate something struggling on the surface. 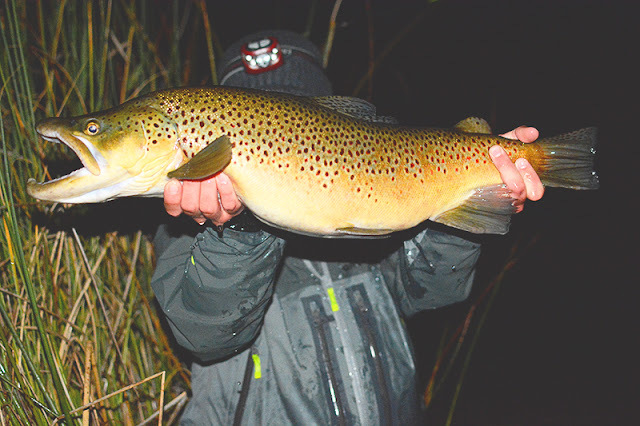 For those who have "moused" with the traditional patterns before, you may have noticed that nighttime takes often occur shortly after the fly hits the water. For these attractor mouse patterns it is all about the water they move and the wake they make, and when something splashes in the water it instantly kicks the fish into "easy-big-meal mode." I think a bass/frog popper would get the same results in many cases. Heck, we catch fish skating streamers, leeches, and even rubber-legs, many of which work when waked upstream, against a swift current. Nothing in nature does that! The only thing I can think of that comes close is a caddis laying eggs. Much of what we call "mousing" is a farce then. Just because we call a fly something, and it catches fish, does not mean the reason it is catching fish is because it resembles the real deal. Our powerful human brains can fill in the gaps between suggestion. We dream, we philosophize, our brains make sense of flawed information, we assume, and we deduce, and what do fish do, they eat, runaway, and reproduce. Now, #fishlivesmatter too, so don't be offended, and that's why we #keepemwet, but the fact is that a fishes' reasoning is very basic and primitive. In the end, most mouse flies fool fisherman and fish, but not in the same way. One thinks it's a mouse, while the other eats something that is moving. So, what is the take-home message here? Well, there are a few things we can gain from this observation. First of all, I think it opens up our thinking so that we can focus on one of the key elements of topwater-trouting; water movement. Second of all, if you want to catch a fish and say you caught it on a mouse, fish a pattern that at least resembles a mouse to the fish (old, long held ideas die hard). Either add some body length to those age old patterns so it more accurately fits a mouses' profile, or fish one of the newer articulated patterns that are cropping up more and more now that people are paying more attention to what a mouse actually looks like in the water. Thirdly, realize that confidence has more to do with fly fishing than the "right fly" in a lot of cases. And lastly, get creative. I really think we could have some fun developing crazy "attractor" patterns to fish at night, ones that focus more on increasing hookups, or adding crazy movement. I'm not trying to rag on anyone who feels they have caught a fish with a "mouse." More than anything I am pointing out an area in fly fishing where we are progressing in terms of understanding and fly design. If you are doing something that is working for you, by all means keep doing it and keep enjoying it. In the end, all we fishermen are fooling ourselves, telling lies and making up stories, but isn't that part of the fun. Sometimes it causes me to wonder though, between the angler and the fish, who is fooling who.